I'll start with the only thing from this album I wasn't too keen on - Greg on the bass is difficult to hear sometimes. Like you'd maybe notice if it wasn't there but you don't notice so much that it is. That's pretty much my only criticism. That and the fact that 'First Strike Is Deadly' is not here. Hey, we can't have everything. To be fair, Testament fans are pretty spoilt here. One of the things I always love about Testament is the fact that Chuck growls but I can always distinctly understand it. Gene Hoglan has the rhythm and timing of a Swiss quartz watch. I'm going to go out on a limb here and say - with maximum respect to the previous drummers like Paul, Dave, John and of course Lou - that Gene is for me the finest drummer I have ever heard with Testament. Each to their own I am sure opinions will differ. Hell, it's not like any of them are bad! However, back to the album. 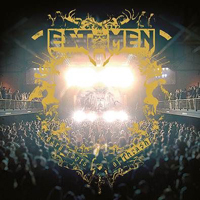 Testament pull off a great mix of material from 'Dark Roots Of Earth' with many other classics from the early albums. I think it is a testament (see what I did there? I'm clever) to their skill as musicians and performers that they could play things from all over the last 30 years and be so consistent throughout in the delivery. That's becoming a rarer thing with bands that have been around as long as Testament have, particularly when it's thrash metal. They do abstain from the majority of their 90s discography, with only a few of tracks from 'The Gathering'. I'm sure to some people that will probably matter, but I don't see why it should. The newer material from the latest album and also their penultimate offering, 'Formation Of Damnation' sits comfortably in there with the classics like 'Over The Wall' and, of course, 'Practice What You Preach'. They haven't wavered away with their new material or pulled any punches in their live performance. Like I said about the live Kreator album earlier last month - this makes you want to be there. Lucky for all of you this is a live DVD/blue ray release too.